Weather: Clear except for a thin band of smoke along horizon, pleasantly warm with a light breeze. Limiting Magnitude: 7.1 in late evening, 7.2 in early morning. Increased auroral glow in N on a couple of occasions. The gegenschein and zodiacal band were visible, and the zodiacal light was very impressive and extensive in the morning. An extremely intense night! Good sky conditions and good weather made me push my endurance to the limit. I made good progress on my list of galaxy groups, and the views of late fall/winter objects were the best I've ever had in some cases. I started out with a couple of planetaries. PK52-2.2 in Aquila is very small and nearly stellar even at 230x. At 390x, it takes on a bluish tinge, and shows a small disk that brightens strongly toward the center. PK72-17.1 in Vulpecula, an extremely large planetary, eluded me even under these conditions. I guess there is just not enough contrast between the nebula and the rich star field. I used an UltraBlock; perhaps an OIII filter would be better. 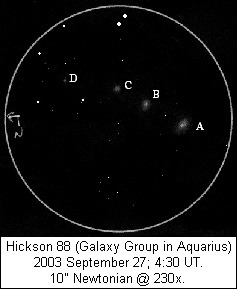 Hickson 88: The two brightest galaxies (NGC 6978 and NGC 6977) are visible at 76x and have a prominent field star between them. NGC 6978 is elongated NW-SE and has a prominent core and stellar nucleus. NGC 6977 is round and has a stellar nucleus. NGC 6976 is an AV1 object that is round and evenly illuminated. 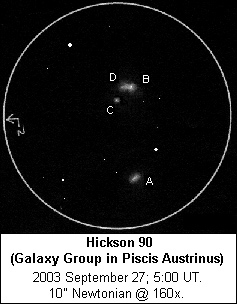 NGC 6975 is AV3 and quite small, but possibly elongated E-W.
Hickson 90: Very nice, bright grouping. All 4 galaxies are visible directly. A (NGC 7172) is elongated WNW-ESE, with a bright and elongated core. BD (the NGC 7176-74 pair) is the dominant object in the field, elongated E-W. The NGC 7176 portion is round with a highly condensed core and stellar nucleus. NGC 7174 is slightly brighter in the center and is itself elongated E-W. It tapers slightly to the W. NGC 7173 is smaller than the other galaxies, and is nearly round with a stellar nucleus. Hickson 91 showed what a great night this was. NGC 7214 was easy as expected. However, I also picked up the B object, MCG-5-52-39, rather quickly at the AV2 level. 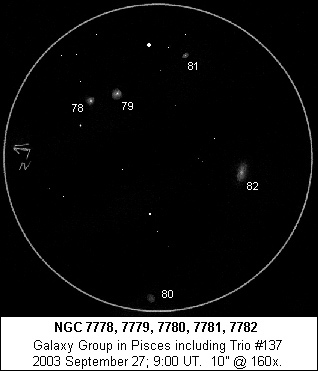 While looking for the C galaxy, I could make out a little blip near NGC 7214, in the precise location of the D galaxy, MCG-5-52-35. It was AV2 as well. I eventually found C, MCG-5-52-36, the toughest object in the group at AV3. 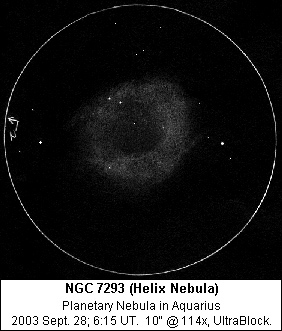 NGC 7214 is round with a nonstellar core that is much brighter than the halo. 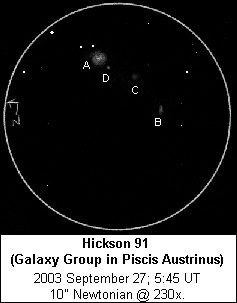 H91B is slightly brighter in the center and strongly elongated N-S. H91C is round and evenly illuminated. H91D is small, highly condensed and nearly round. 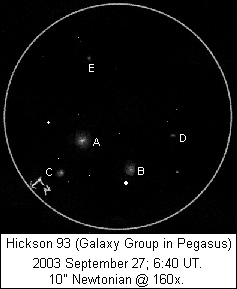 Hickson 93 has three fairly bright galaxies and two fainter ones. A (NGC 7550) has an elongated E-W core and a faint, nearly round outer halo. B (NGC 7549) is elongated E-W and has a stellar nucleus and a large, faint halo. 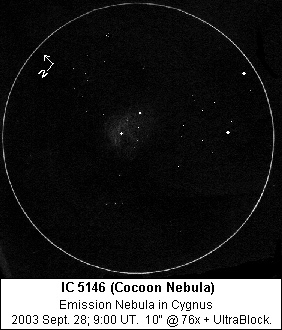 C (NGC 7547) is highly condensed with a stellar nucleus and is nearly round. D (CGCG 454-15) is AV2, evenly illuminated and slightly elongated NE-SW. E (NGC 7558) is also AV2, very small and condensed. It is nearly round. I looked at Hickson 94 but didn't sketch it. At least two galaxies were visible in a confusion of field stars. 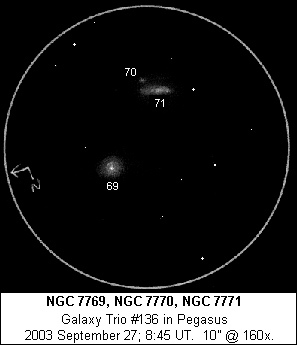 The NGC 128 group is another 5-galaxy "trio". 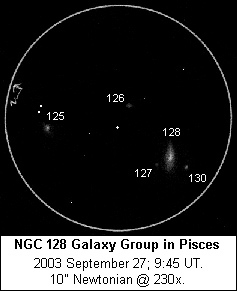 NGC 128 is elongated NNE-SSW. It is lens-shaped, but slightly thicker and fainter to the N. From the bright center to the S, a bright bar runs along the semi-major axis. The bar curves slightly to the W. NGC 130 is a round, well-condensed AV2 object off the S end to the E. NGC 127 is closer to the big galaxy on the SW side, and is a more difficult AV4. Just over 5' to the S lies NGC 126, a very small, evenly illuminated glow elongated E-W. 7' to the W of NGC 128 is NGC 125, condensed and elongated SW-NE. I took a break from galaxy groups for the remainder of the session. I hit a few of the southern highlights. Some, like the galaxies NGC 55 and NGC 1097, were close enough to the smoke on the horizon to seem a bit diminished. 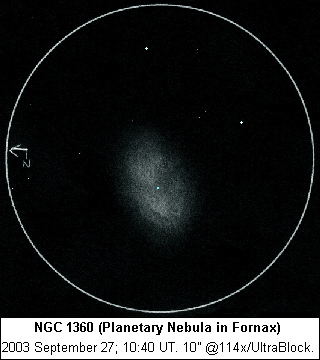 NGC 1360, a big planetary nebula in Fornax, was very interesting. It is elongated 8' x 6' NNE-SSW and at first glance appears as an evenly-illuminated blue-gray glow around the bright central star. At 114x with an UltraBlock filter, I could make out some interesting structure. The area E of the CS is darker. To the SSW, there is a brighter wedge, and a similar area begins just W of the CS and extends NNE. 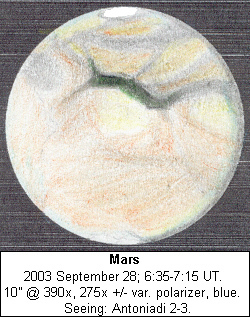 The result is a subtle M27-like appearance. Nice! A sketch is at the bottom of the page. 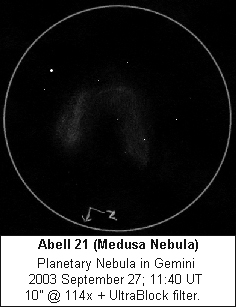 I did a rough sketch of Gemini's Medusa Nebula, Abell 21. This object was fairly difficult even with the good conditions and the UltraBlock. The brightest part is the detached southernmost section, a linear E-W streak that varies in brightness and thickness. With difficulty, a curving section can be made out to the N, passing through a field star. The nebulosity in Orion was really popping in the morning, with the Great Nebula shining an electric blue-green. I turned to M78, and for the first time I saw the faint nebulae NGC 2064/2067 nearby (in addition to the much brighter NGC 2071). With all these objects, you can see that there is nebulosity throughout the field, broken by dark lanes. I've never seen so much nebulosity around the Pleiades! Not just Merope, although that nebula seemed larger than ever before. Alcyone and the other "dipper" stars were surrounded with irregularly-shaped misty patches as well. Seeing was just fair. Saturn looked nice anyway, with the C ring and 6 moons visible. Jupiter and Mercury were less impressive, staying down in the turbulence, although Jupiter did show lots of detail and Mercury's phase was apparent. I turned to the Trios list next. Trio 131 was a bit of a head-scratcher. These galaxies are listed as bright as magnitude 12.1 (NGC 7530, but appeared much fainter. They were still visible. NGC 7532 was the brightest, an evenly illuminated fuzz elongated ~N-S. NGC 7534 was conspicuous for being near a field star, but was evenly illuminated and amorphous. 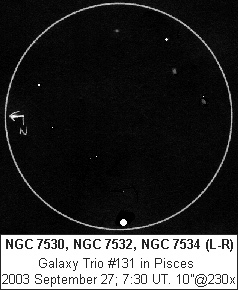 NGC 7530 was AV1, small and slightly condensed, elongated ~E-W.
Trio 136 (sketch at top of page) was a nice change of pace. NGC 7769 is bright and round with a bright core and stellar nucleus. NGC 7771 is bright and elongated WSW-ENE. It showed uneven illumination/mottling along the major axis, with bright patches near the center, just W of center, and 2/3 of the way toward the E end. Slightly detached from the WSW end of NGC 7771 is NGC 7770, a small, condensed round patch. Trio 137 is part of a small group, with 5 galaxies visible. NGC 7778 and 7779 are a close pair of round, highly condensed galaxies, with NGC 7779 being slightly larger and brighter. NGC 7781, farther away, is smaller but also condensed. ~10' NE of NGC 7779 is NGC 7782, the brightest galaxy in the field. It is elongated 2:1 N-S and brightens gradually toward the center. At the N edge of the field at 160x is NGC 7780, faint and round and evenly illuminated. Weather: Clear and mild with a light breeze; horizons noticeably brighter. Limiting Magnitude: 7.1 in late evening, 7.0 in early morning. Another nice night; this one seemed to lose a bit of an edge, though. Seeing was a bit steadier, but faint galaxies seemed less willing to pop out. I began in twilight, looking at showpieces. The sky was contrasty enough already to show open and globular clusters as good or better than on a normal Chiloquin night. 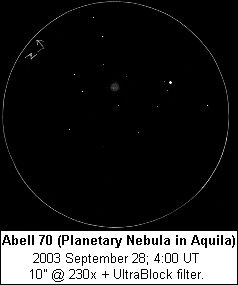 My first "dark target" was PK38-25.1 (aka Abell 70), a planetary in Aquila. It was faint, but not difficult once I recognized it. It showed a gray disk that was slightly elongated N-S and nearly evenly illuminated. I saw 3 members of the NGC 7184 group, but the sky background was grayish. I didn't see the fourth member. I did sketch the Helix Nebula nearby. I broke my "no Mars" promise. Seeing was pretty steady, but not quite good enough to reveal the finest detail. Contrast was good overall, though, so I made a sketch. Abell 2634 in Pegasus is a sprawling group with lots of galaxies; I counted 11 over a 45' field. 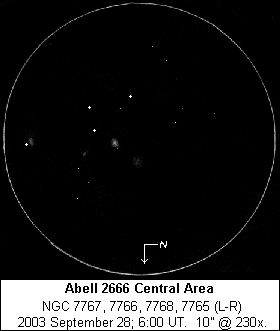 Nearby Abell 2666 was less populous and more compact, with 5 galaxies visible in a 15' circle. 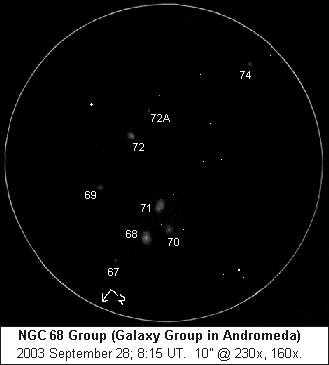 The NGC 68 group in Andromeda was very interesting. Even at 36x, there was something there, like an open cluster with nebulosity. This is a compact group with some very faint galaxies mixed in with a congregation of field stars. I saw 8 galaxies, but NGC 69 was AV4 and NGC 67 was AV5. The association with stars makes this group seem more populous than it really is. I jumped over to the Cocoon Nebula in Cygnus for a change of pace. The nebulosity was barely more visible than at home, but the shape was better-defined. The UltraBlock seemed to help. 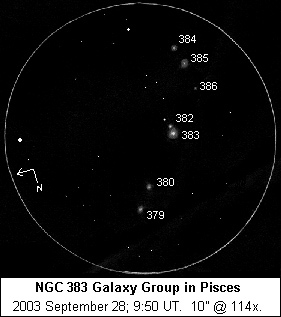 NGC 383 group, the Pisces Chain, was really neat to view and sketch. I only worried about the central area, with 8 visible members. Oops, I missed NGC 388 on the chart, so I didn't look for it. This is one that I can explore more thoroughly at home. 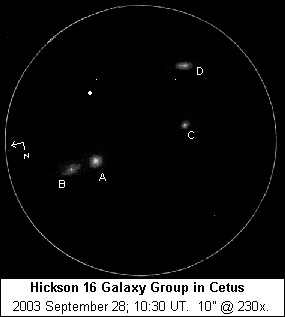 Hickson 16 in Cetus is a nice, bright group of 4 galaxies. The AB, E-W pair of NGC 835 and 833 is really striking. NGC 835 is round, with a bright core. NGC 833 is elongated E-W with a stellar nucleus and evenly illuminated halo. C, NGC 838, is small, round and condensed. D, NGC 839, is another elongated galaxy with well-defined edges and a bar-like core. I shut down the sketching and wandered about the winter sky. The Rosette came alive with its polygonal shape and dark intrusions when viewed at 44x and the UltraBlock. NGC 2174, a large nebula on the Orion-Gemini border, was very easy and nice to look at: a milky bluish haze of over 1/2 degree with a bright central star and well-defined edges. Jones-Emberson 1, the big two-lobed planetary in Lynx, was rather easy to detect. Harder to get a good grasp on, it looked like a fainter version of the Helix with some rather bright stars superimposed. The two lobes were prominent, but not as well-defined as descriptions and photographs led me to believe. The Eskimo was awesome at 390x. I've never seen the inner "face" so well-defined with so much detail. Saturn didn't look bad, either, although it wasn't rock-steady. I could sometimes make out the Encke division in the outer part of the A ring. I didn't stay up for Jupiter and Mercury this morning. I think I did more serious observing during these two nights than I did at OSP in August. The better weather and extra darkness sure helped. Wasn't that a party? At the same location as the Oregon Star Party, but a month later, a few of us enjoyed nice skies. Compared to OSP 2003, the skies were better. It got dark earlier and stayed dark later. No crowds or parking problems, either!